There are certain items that I run out of on a regular basis, but am too stupid to pick up ahead of time. I don't have this problem with some things, such as milk, or bread, or fruit. But some items I seem to be wired to run completely out of before going to get more. Cat litter, for example. Coffee, for another. Wine. I'll watch the stocks of whatever-it-is getting lower and lower. "Huh," I'll say to myself. "I really should go get some more before I run out." And then I don't, and I run out exactly five minutes after whatever store sells it has closed, and then I'm grumpy for the rest of the night. I have this problem with tea. And of course, there's absolutely no reason to ever run out of tea. My regular source is mail order from Upton Tea Importers, as I have discussed before. They make buying tea as easy as Amazon makes purchasing books via One-Click. I could just spend 5 minutes on the web and it will show up at my door a few days later, preventing my having a caffeine crisis. But I just can't plan ahead: I need the panic to motivate me to buy the tea, apparently. I was in this state of utter tealessness the other day when I remembered that there was a shop in Squirrel Hill that sells tea, and coffee, and chocolate. I'd stopped in a few times just to check them out, and this seemed like a good excuse to try their tea. The shop is called "Wicks and Beans", and despite the somewhat unfortunate name has a nice and eclectic selection of tea, coffee, European chocolates and candies, and assorted tea pots, coffee mugs, and other paraphernalia. 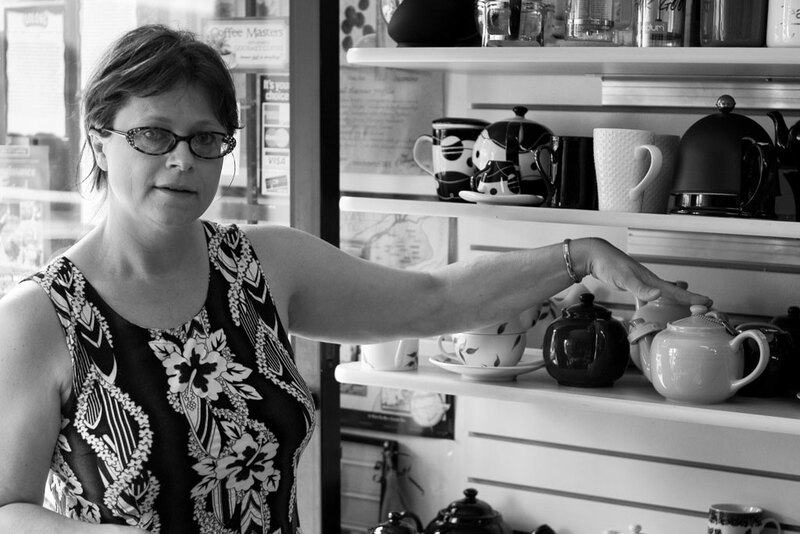 I chatted for a while with Margaret, the owner, about how she started the shop, and how she decides what to stock. She also carries several lines of apparently fancy European skin products. But I haven't tried those, yet. I haven't tried her coffee yet, either, because there are so many good coffee roasters in Pittsburgh already, and I'm set in my ways. But her tea selection was interesting and wide, and she understands how to keep the product fresh (the glass jars are mostly for show; there are sealed airtight packets on the shelves underneath.) And I like her selection of saucers and teacups. The most unfortunate thing about the store is how hard it is to find. It's a storefront on Murray Avenue, next to Kazansky's Deli. I must have walked past this place ten times before I actually realized it was there. I only discovered it because one day I was desperate for chocolate and, well, a man in need of chocolate can transcend his limitations. I'm always worried that the place will disappear because it feels more like a stimulant-based five and dime than anything else. This isn't Mon Aimee chocolat; there's a few well-chosen chocolate bars and a variety of candies, but not an encyclopedic array. There's a little of this. A little of that. In this age of specialize or die, I find something mulishly satisfying in a store that insists on offering a few well-chosen items in a number of categories. I love the dazzlingly array of choices that the specialist stores give me, but be honest: how many hundreds of types of single-plantation Venezuelan chocolate does one need to be satisfied? Is Wicks and Beans' selection as good as Upton's? Not even close. It's a tiny little shop, their web site is just an eBay store, and the only employee (that I know of) is the owner. Pittsburghers spend a lot of time complaining that there aren't enough quirky local stores, and that the suburban mega-chains are constantly encroaching on our territory. Well, here's a quirky local store in the heart of Squirrel Hill that sells quality tea at reasonable prices. Stop in and say "hi." Have some chocolate for me. It was amazing to walk in there and actually be dealing with the owner of a quirky store instead of the salesdroid (or, more likely, the signage) of a big-box store. We chatted, she was extremely helpful, and when she thought of a better solution that didn't involve buying her stuff, she told me about it anyway. Her pots & cups were interesting; I didn't see as many at the more coffee-oriented shops down in the Strip. Haven't tried the teas. This is the best place in Pittsburgh to buy tea. Margaret is charming and very well informed. Lots of neat little gadgets too...and some interesting Eatern European stuff....choclates,snacks....even cosmetics. Very nice little shop. Good coffee bean selection too.